In the male urogenital system all the organs are connected: disorder of one of them will lead to disorder of the others. That is why, if you have started the treatment, it is necessary to act upon all the below mentioned areas. Areas to act upon: pubic, suprapubic, sacral, lumbosacral areas, perineum, testes, urethra, and inner surface of the thighs. Hair must be removed or shaven in all areas meant for action. The areas should be treated in the order — from the most actual manifestations at the sessions to the less actual ones. Basic areas (three tracks, 6 points, 4LI (4II) and the forehead) are expedient for treatment as well. 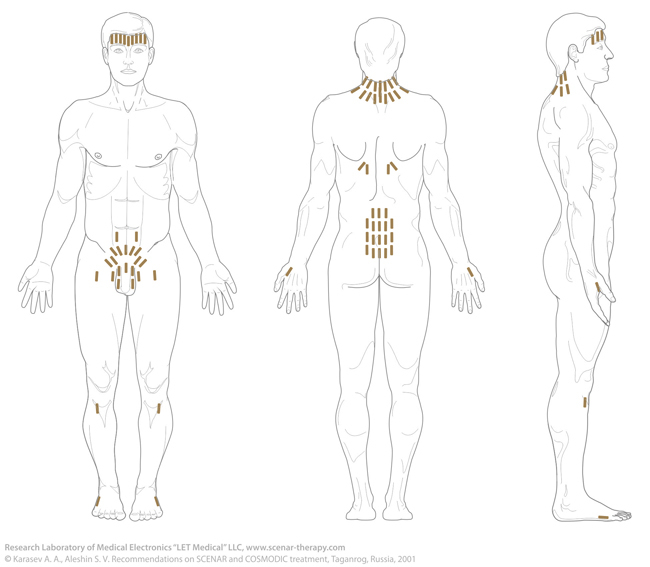 The course of treatment includes 10–14 sessions. Antibiotics and anti-inflammatory medications must be avoided. Cleansing enemas are necessary for treatment (for treatment of prostate adenoma it is obligatory). for treatment of urethritis the main areas for action are perineum and the whole urethra. The patient is treated in lying on the back position with the legs moved apart (the position may be different but it must be convenient for the patient and action). In advanced cases of prostatitis recurring course of treatment is expedient (three months later or earlier in exacerbation period). Prostate adenoma usually requires 2–3 courses of treatment with three months’ pauses. There are also known cases when one course of therapy was enough for effective recovery. Besides, the patient should be prescribed regular purgation (twice a week during the pauses between the courses of treatment). Hydrocele is just a small part of large pathology and the recovery proceeds from inside out — from the kidneys to the testicle’s tunics. The area of kidneys is obligatory for treatment. In case of need the patient should be conducted recurring course of treatment three months later.